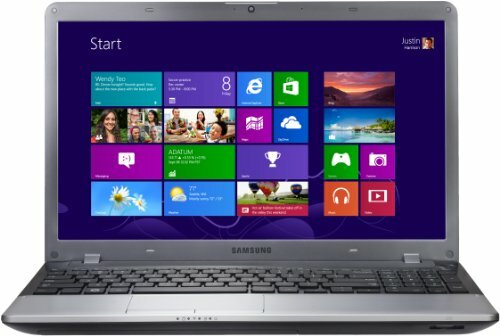 Below is our review of the Samsung 350V5C, a 15.6" laptop, featuring 6GB RAM, 500GB hard drive and Windows 8. The Intel Core i3 3110M 2.4GHz processor is a third generation from Intel, and it compares favourably to regular desktops in terms of CPU. The laptop loaded pretty fast – taking around 45 seconds, if you use Samsung's fast boot facility. We found battery life to be pretty good - lasting just under five hours from our test period consisting of average web / gaming use. There is also a facility to tailor your battery usage with the inbuilt Samsung power saving settings. A clear 15.6" Samsung screen provides great viewing, and is both easy on the eyes as well as crisp enough to show details. Audio is also catered for by the inbuilt set of speakers. Screen resolution is a 1366 pixels by 768 pixels by default, with the additional option of an HDMI port, so you can output to your TV in HD. It performs quietly, with the occasional noise of the fan starting up - however you can adjust this to come on less frequently if you do desire, thus saving battery power. The keyboard and trackpad both performed well, typical of Samsung's product range. The trackpad was spacious, providing accurate multi touch control over the laptop. Similarly the keyboard was easy to type on; a spacious layout, with each keypress being pretty quiet. We had no issues with this aspect of the laptop whatsoever. Standard laptop facilities, such as a Webcam, DVD drive, card reader were all provided - again no problems here. From an aesthetic perspective, this laptop looks stylish - it's mainly constructed of plastic, but feels solid, and the frontal area looks especially well finished, in textured metal. Weight is around 3.45kg, which is around average for a laptop of this size - inside the box you'll find the Samsung 350V5C laptop itself, a Battery, an AC adapter, a power cord, and the user guide. Pros: A fast third generation processor, decent screen, 6gb RAM, making this laptop both run fast and be fun to use. Looks good and performed well. Cons: Mainly plastic construction, although feels solid to the touch. To conclude - a decent specification laptop, from a leading laptop manufacturer in Samsung, at a very reasonable price.